The Stanford Invitational has been the mid-season litmus test for many teams throughout California and beyond for many years. After a mini one-year hiatus, the Invite returned yesterday on the last Saturday in September. The featured seeded races certainly lived up to top billing as several teams and individuals made statements that carry statewide ramifications. In the boys' seeded race, Claremont won over a very potent La Costa Canyon team as well as the defending Division II state champ, St. Francis. 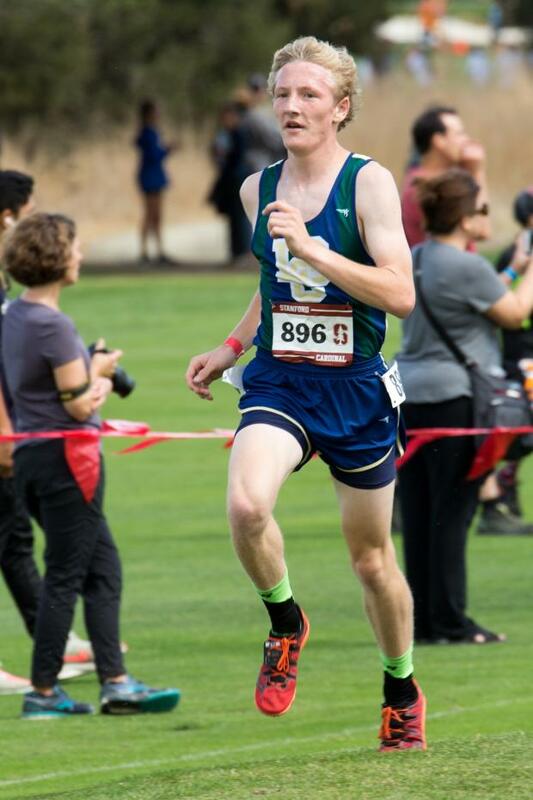 Claremont was led by Ryan Cowgill who finished in 8th place with a time of 15:26.50. Claremont displayed outstanding team running and depth as their top five all dipped under the 16-minute mark (only team to do so this year). The video below of the boys' seeded race was taken by Jesuit coach, Walt Lange. The LCC team was led by individual winner Jacob Stanford (above courtesy of Malcolm Slaney) and 2nd place finisher Caleb Niednagel. They finished just 10 points behind Claremont and their top runners at the front end to scare any team in California, regardless of division. St Francis MV enjoyed a historic season last year that culminated with a section and state titles as well as 9th place finish at NXN. Yesterday, the Lancers finished in 3rd place without one of their top runners (Eric Eng) but they would not have been able to surpass the top two teams with a fully healthy lineup. The Granada boys made it a clean sweep for Division II teams as they powered their way to a fourth-place finish. Individually behind the LCC teammates, the list of runners was a familiar one with Clovis North junior Isaiah Galindo, De La Salle senior Connor Livingston, St. Francis senior Colton Colonna, Stockdale senior, Marcus Mota and Bellarmine sophomore Colin Peattie all breaking into the top 10. 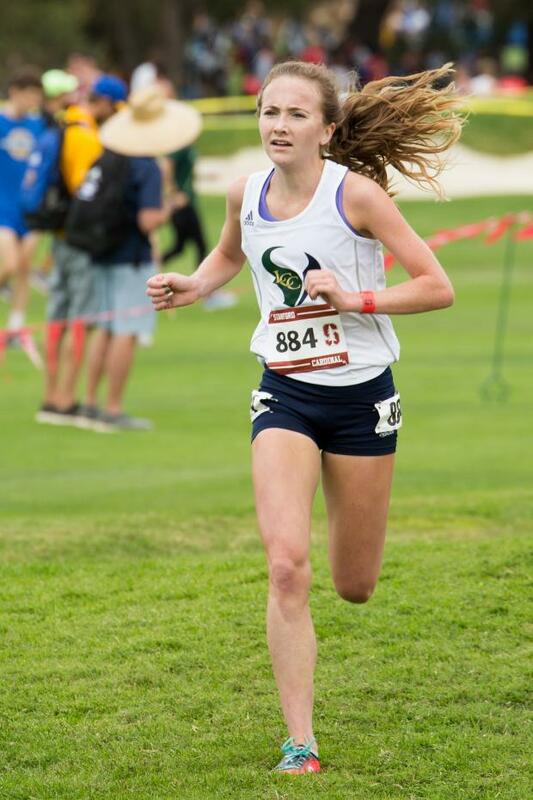 For the seeded girls' race, La Costa Canyon made their presence felt as well with the individual champion, Kristin Fahy (above courtesy of Malcolm Slaney). They also finished second as a team behind an even more impressive Claremont team. For those you paying attention, Claremont swept both seeded races which bodes well for them as they turn their attention to races in October and November. A strong Granada team that podiumed at state last year finished in third place just ahead of two strong programs, Davis and Sage Creek. Individually, Kyla Becker was the first non-California runner in second. She was followed by Claremont teammates Sydney Hwang and Maddie Coles. Skyler Wallace led the Sage Creek team with a 5th place finish ahead of Claremont's third runner, Azalea Segura-Mora. Del Oro freshman Riley Chamberlain rolled to a solo 17:58.20 victory in the Division III race. Nevada Union senior Garrett Gough won the Division III race in an equally impressive 15:13.90 time. Kate Tavella and Emma Tavella finished in first and second in the Division II race as they led San Ramon Valley to the team title. Claremont showing their amazing depth finished in 2nd place behind San Ramon Valley in the same Division II race.